An essay on nature and immutability of truth; in opposition to sophistry and scepticism. By James Beattie, Professor of Moral Philosophy and Logic in Marischal College and University of Aberdeen (Edinburgh: printed for A. Kincaid & J. Bell. Sold, at London, by E. & C. Dilly, in the Poultry, 1770) [multiple editions into the 19th century] Second edition (1772) available online from Google Books. Dissertations moral and critical. On memory and imagination. On dreaming. The theory of language. On fable and romance. On the attachments of kindred. Illustrations on sublimity. By James Beattie, LL. D. Professor of Moral Philosophy and Logick in the Marischal College and University of Aberdeen; and Member of the Zealand Society of Arts and Sciences (London: printed for W. Stahan, and T. Cadell in the Strand; and W. Creech, at Edinburgh, 1783) First volume available onine through Google Books. 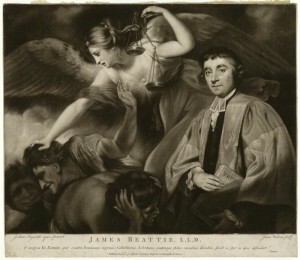 Short James Beattie biography at Northern Lights: The Scottish Enlighenment. *For references, see the Site Bibliography. This entry was posted in Beattie, James, Teachers of Natural Law in Scotland and tagged 18th century, Aberdeen, Marischal College on 27/09/2013 by Karen Baston. David Fordyce, The Elements of Moral Philosophy, in Three Books with a Brief Account of the Nature, Progress, and Origin of Philosophy, ed Thomas Kennedy (Indianapolis: Liberty Fund, 2003) Available from Online Library of Liberty. This entry was posted in Fordyce, David, Teachers of Natural Law in Scotland and tagged 18th century, Marischal College, Professor of Moral Philosophy on 27/09/2013 by Karen Baston. This entry was posted in Gerard, Alexander, Teachers of Natural Law in Scotland and tagged 18th century, Aberdeen, Marischal College on 27/09/2013 by Karen Baston.